Kindly be informed that this GDPP does not apply to our processing of personal information on behalf of and subject to the instructions of third parties such as agents and service providers such as our appointed and/or third party reservation agents, companies that organize or offer packaged travel arrangements, marketing partners, or corporate customers. At every contact point or guest interaction, and in conducting every aspect of our business, we may collect personal information. This personal information may include: your contact information; information related to your reservation, stay or visit to a property; participation in a membership or loyalty program; participation in a lucky draw or marketing program (even if you do not stay at one of our hotels); information related to the purchase and receipt of products or services; personal characteristics, nationality, income, national registered identity card /passport number and date and place of issue; travel history; payment information; guest preferences; marketing and communication preferences; information about vehicles you may bring onto our properties; reviews and opinions about Holiday Villa Hotels & Resorts portfolio, or properties (if they are identified or associated with you); frequent flyer or travel partner program affiliation and member number; hotel, agents and accommodation packages booked; groups with which you are associated for stays at hotels; information needed to administer the our programs and profiles, including transaction and correspondence details; information provided on membership and account applications; and other types of information that you choose to provide to us or that we may obtain from third parties. 1. Arrivals/Check In: Local laws and legislation require that we collect personal information during registration/check-in at our properties. We may also use closed circuit television and other security measures at our properties that may capture or record images of guests, visitors in public areas and information related to your location while on our properties via keycards and other technologies. We may also use other technologies that record sound or video to protect our staff. In addition, we may collect personal information in connection with on-property services, such as concierge services, health/recreational clubs, spas, activities, child care services, and equipment rental. 2. Villa Gold Card : When you enroll in our Villa Gold program, we will also ask you to indicate whether you are at least 18 years old, and we will record a Villa Gold Card number and may be in future, password for you. When you manage your profile online, you have the opportunity to provide additional information about your preferred choices, your room type preferences, your language preferences, your credit card account(s), your email subscription preferences for receiving news, offers and information from us, and to create a User ID and password. This may extend to situations when you book a rewards related reservation or purchase our promotions online, we may ask for additional specific account information. 3. Campaigns/Surveys: We may request demographic data or other personal information in customer surveys. a. If you submit an online “pre-application” for prescribed survey/campaign or if you submit a reservation or information request online, or participate in an online “click-to-chat” type feature, we may ask you to provide your annual income range or reservation information. If you attend a Holiday Villa event, or preview tour, or enter a lucky draw, we may ask you to provide information about your family composition, travel preferences, frequency of travel and other vacation history information. 4. Functions/Meetings/Banquets: If you plan a function/meeting/banquet with Holiday Villa, we collect information such as the date of the event, number of guests, details of the guest rooms, and, for company function/meeting/banquet, information on your company and information about the guests that are part of your group or event. If you visit us as part of a group, we may have personal information about you provided to us by the group and may market to you as a result of your stay with a group or attendance at an event. If you visit us as part of an event, we may share personal information about you with the function/meeting/banquet planners so they may include you as part of the event. If you are an event planner we may also share information about your event with third-party service providers who may market event services to you. 5. Online Accounts: When you register an online account, we also ask you to select a username and password. 6. Social Media & Blogging: If you choose to participate in Holiday Villa -sponsored social media activities or offerings, we may collect certain information from your social media account consistent with your settings within the social media service, such as location, check-ins, activities, interests, photos, status updates and friend list. You should understand that you may be subject to the terms and conditions and any privacy policies of the social media site and that Holiday Villa is not responsible for your activities on social media sites. 7. Forward-to-a-Friend: From time to time, we may offer a feature that allows you to send an electronic postcard or otherwise share a message with a friend, whether via the Internet, a stand-alone kiosk or mobile. If you choose to do so, we will ask you for the recipient’s name and email address, along with the text of any message you choose to include, or you may be able to use a pre-populated message. By using this feature, you represent that you are entitled to use and provide us with the recipient’s name and email address for this purpose. 8. Employment Applications: If you choose to apply online for employment with Holiday Villa, please see our Personal Data Protection Policy for Job Applicants. You need to know that we may also obtain information about you based on the information you provide to us or from Other Information we receive. We may also collect information about you from third parties, including information from our agents, credit card, and other partners and associates, information from social media sites consistent with your settings on such sites, such as social media sign-on programs, and from third-party sources. Holiday Villa may append this information to the information we have on file for you and share it with others consistent with this GDPP. We use your personal information to provide the services you request from Holiday Villa, or which are part of a program you have joined or a purchase you have made. We also use your personal information to provide you with information about meeting and event planning and access to specific account information for administrative purposes. In addition, we may use your information to: improve Holiday Villa’s services; provide you with the expected level of hospitality; ensure our site, products and services are of interest to you; process enrollments and applications; and facilitate collections. We also use the information to provide or offer you newsletters, promotions and featured specials, other marketing communications, product or service awareness marketing, and to conduct surveys, lucky draws, prize draws, and other contests. We may provide these communications online, via email, telephone, mobile/text messaging (including SMS and MMS) and postal mail. As an international hotel management company, we are committed to provide you with the same level of service that you have come to expect at Holiday Villa. In this context, we may share your personal information among properties associated with Holiday Villa Hotels & Resorts, including the licensed/managed only entities, or service providers that may be located in countries outside your own. Although the data protection laws of these various countries may not be as comprehensive as those in your own country, Holiday Villa will take appropriate measures to ensure that your personal data is handled as described in this GDPP. Holiday Villa Hotels & Resorts –Owned/Joint venture properties: We may share personal information with our owned/joint venture properties within the Holiday Villa Hotels & Resorts brands. Licensed & Managed Properties: We may share personal information with owners and operators of Licensed / Managed properties. Electronic Billing Program: If you participate in a corporate electronic billing program or any current and/or future online program, billing information will be shared with the credit card provider and if you use a corporate credit card, possibly, your employer. Functions/Banquets or Meetings: If you visit Holiday Villa as part of a group function/banquet or meeting, information collected may be shared with the organizers of those function/banquet or meeting, and, where appropriate, guests who organize or participate in the function/banquet or meeting. Business Associates/Partners: From time to time we may partner with other companies to provide products or services and may share your information with our business partners to provide those products or services to you. For example, we may help to arrange rental car or other services from our business partners, and share personal information with our business partners in order to provide those services. If you are an Villa Gold Card member, we may share your personal information with our business partners in order to credit you with program benefits or other benefits earned through your participation in the Villa Gold Card program, if there is any. Co-Sponsors for Joint Promotions: Holiday Villa Hotels & Resorts may co-sponsor promotions, lucky draws, prize draws, competitions or contests with other companies, or we may provide prizes for lucky draws and contests sponsored by other companies. If you enter one of these lucky draws or contests, we may share your information with our co-sponsor or the third-party sponsor. On-property Services: We may share personal information with providers of on-property services that provide services such as concierge services, spa treatments, or dining experiences and others. Service Providers: We rely on service providers to provide certain products and services, such as to facilitate administrative functions and information technology operations, credit card billing, reservations services, administering the Villa Gold program, Holiday Villa Club program, providing services in connection with our websites, including agents and accommodation packages; communicating news and delivering promotional and transnational materials via email, direct mail, and online and mobile advertising; processing credit card transactions; professional services such as accounting, auditing and legal advice; investigating accident reports; processing insurance claims; and administering lucky draws , prize draws, competitions and customer surveys. Holiday Villa will disclose personal information to service providers as appropriate. Business Transactions: As we develop our business, we might sell, buy, restructure or reorganize businesses or assets. In the event of a merger, consolidation, sale, liquidation or transfer of assets, Holiday Villa may, in its sole and absolute discretion, transfer, or assign information collected, including, without limitation, other information and personal information, to one or more affiliated or unaffiliated third parties. Telemarketing: If you stay at a Holiday Villa Hotel or you are a Villa Gold Card/Holiday Villa Club member, we may share your telephone number among our group of partners, for purposes of telemarketing. We may also receive your telephone number from our partners or from other sources, which we may use for telemarketing purposes. Others: In addition, Holiday Villa may disclose personal information in order to: (i) comply with applicable laws, (ii) respond to governmental inquiries or requests from public authorities, (iii) comply with valid legal process, (iv) protect the rights, privacy, safety or property of Holiday Villa , site visitors, guests, employees or the public, (v) permit us to pursue available remedies or limit the damages that we may sustain, (vi) enforce our websites’ terms and conditions, and (vii) respond to an emergency. As Pertinent Information does not and may not personally identify you, such information may be disclosed for any purpose. In some instances, we may combine Pertinent Information with personal information. If we do combine any Pertinent Information with personal information, the combined information will be treated by us as personal information in accordance with this GDPP. We do not knowingly collect personal information from individuals under the age of 18. As a parent or legal guardian, please do not to allow your children to submit personal information without your permission. To book a reservation from a mobile device or one of our apps, you will be required to enter some personal information. To view or change reservations or to book a reward stay, you will be required to sign in to your account or you will be required to provide your confirmation number and additional security codes. We shall provide mobile apps that can be downloaded to smart phones. These apps have a variety of functionalities that enhance the customer experience. In addition to providing services, our apps may collect personal and Other Information that will be used in accordance with this GDPP. We provide a link to this GDPP to customers prior to their downloading of any of our apps. Our mobile apps may use your device’s global positioning system technology to locate a hotel near you and/or to provide you with relevant location-based information. We may also share this information with third parties. We will abide by your device’s settings when accessing any geo-location data. To the extent any geo-location data is combined with personal information, that information will be treated as personal information in accordance with this GDPP. Our sites and our mobile applications may contain links to third parties’ websites. Please note that we are not responsible for the collection, use, maintenance, sharing, or disclosure of data and information by such third parties. Other third-party websites include the landing page of the high-speed Internet providers at our hotels, as well as social media sites (such as Facebook and Twitter) on which Holiday Villa or our properties may have accounts or fan pages where you may be able to post information and materials. We also seek to require our affiliates and service providers with whom we share personal information to exercise reasonable efforts to maintain the confidentiality of personal information about you. For online transactions, we use reasonable technology to protect the personal information that you transmit to us via our site. Unfortunately, however, no security system or system of transmitting data over the Internet can be guaranteed to be entirely secure. If you are a Villa Gold Card member, the information you provided to us at the time of registration may be accessed, reviewed and updated at any time by signing in to your Villa Gold application. In line with our principle to protect your confidentiality, we can only respond to such requests to the email address that you have registered or otherwise provided to us. Please remember that if you make such a request, we may not be able to provide you with the same quality and variety of services to which you are accustomed. In addition, in some circumstances based on applicable law, you may request that we cease sharing personal information about you with our business partners or that Holiday Villa cease using personal information about you on the grounds that such personal information was acquired by unjust means or used in violation of law by sending your written request to Holiday Villa, B-16-8, Megan Phileo Avenue II, 12, Jalan Yap Kwan Seng, P.O. Box 11369, 50744 Kuala Lumpur, Malaysia. We will seek to honor those requests consistently with applicable law. We retain personal information about you for the period necessary to fulfill the purposes outlined in this GDPP, unless a longer retention period is required or permitted by applicable law. If you are a Villa Gold Card member, you may receive additional communications from us, including third-party news and offers specifically for Villa Gold Card program members, and co-branded messages from our business partners. Villa Gold Card members may also receive post-stay emails from us. You may change the communications you receive from us by logging on to your online account and managing your subscriptions, or by writing to us (and including your email address) at Holiday Villa, B-16-8, Megan Phileo Avenue II, 12, Jalan Yap Kwan Seng, P.O. Box 11369, 50744 Kuala Lumpur, Malaysia. Please note, however, that if you change the communications you receive from us as described above, we will not be able to remove your personal information from the databases of affiliates, Licensed or business partners with whom we have already shared your personal information (i.e., to whom we have already provided your personal information as of the date of your opt-out request). If you prefer not to receive email marketing materials from us, you may opt-out at any time by using the unsubscribe function in the email you receive from us or by clicking this link: customer-privacy@holidayvilla.com.my and send a request for the opt-out options. 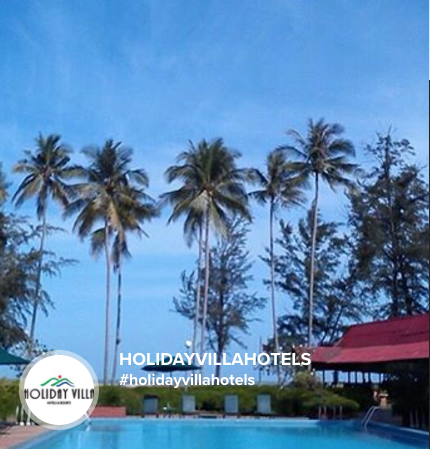 If you have any questions about this GDPP or how Holiday Villa processes your personal information, please contact us by email at customer-privacy@holidayvilla.com.my or by postal mail to Holiday Villa, B-16-8, Megan Phileo Avenue II, 12, Jalan Yap Kwan Seng, P.O. Box 11369, 50744 Kuala Lumpur, Malaysia. The materials contained herein are provided “as is” and without warranties of any kind either expressed or implied to the fullest extent permissible pursuant to applicable law. You agree to indemnify, defend and hold Holiday Villa Hotels & Resorts , direct/indirect subsidiaries online website, harmless from any claims ( including but not limited to claims for defamation, trade disparagement, privacy and intellectual property infringement) and damages including attorney’s fees arising from any submissions by you or through your account.